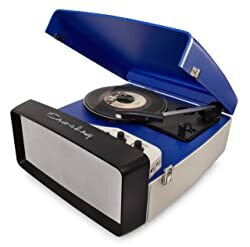 The Crosley Collegiate is a 3 speed portable record player with USB connection. It looks like one of those classroom portable record players from the old days. In fact, many of the Crosley players are copies of vintage products from brands that no longer exist. 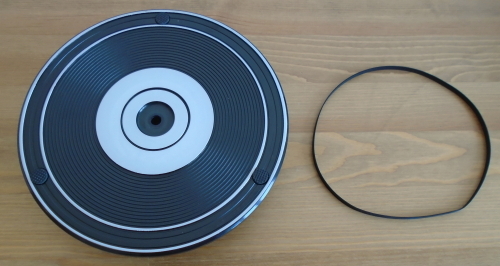 This turntable is one of the few low-end record players with magnetic cartridge. This player can be connected to your computer via USB. This will allow you to digitize your vinyl record collection using your favorite recording software. Because of its cool retro look, the Crosley Collegiate has caught the attention of many vinyl enthusiasts. But don’t get caught until you read this review in its entirety. After all, this is a record player and not only a piece for decoration. I recommend this player to someone looking for an easy to use and small portable player with built-in speakers. You may like this product if you are looking for something that works out of the box and has a decent sound quality. However, if you don’t care about portability, you may consider the Audio-Technica AT-LP60, which is a much better record player at about the same price. This is a good product for someone on a low budget looking to take their vinyl music to different places. If you are looking to play records in a small room like a bedroom, then this player may be what you are looking for. Good option if you have space constraints and need a small unit. This product may also be a good gift for teenagers. Don’t buy this product if you are looking for a hi-fi sound. This unit sounds OK considering the price, but it’s definitely not a high-end turntable. If you are serious about collecting vinyl, save your money and buy something better. If you are used to listening to music with top notch audio equipment or high priced sound systems, then the sound quality of this player may disappoint you. This player isn’t too loud, so I don’t recommend it for parties, large rooms or noisy environments. If you think the Crosley Collegiate is for you, keep on reading, you’ll find valuable information, otherwise you may want to check out my other reviews. 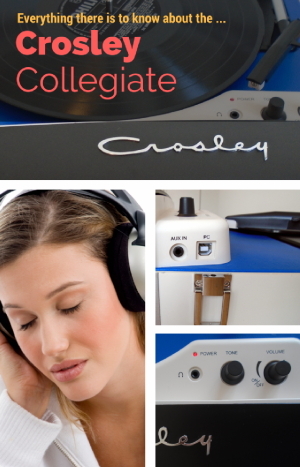 The Crosley Collegiate comes with an Audio-Technica magnetic cartridge. What it means to you is better sound and longer life for your vinyl records. Most low-end turntables come with a cheap ceramic cartridge. I don’t want to repeat myself, so if you want to learn more about the difference between ceramic and magnetic cartridges, read my Turntable Buying Guide. The replacement needle is the NP-5 that you can order directly from the manufacturer. This stylus is the same as the Audio-Technica ATN3600L. You can get it from amazon, ebay or LP GEAR. It has a 0.6 Mil conical diamond tip. 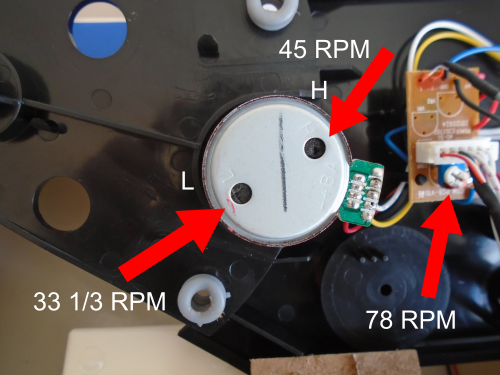 According to Crosley, the NP5 replacement needle can play all three speeds 33&frac13;, 45 And 78 RPM Records. However, If you want to play 78 RPM records, my suggestion is to get a special 3 Mil stylus. 78 RPM records have wider grooves than LP records. Your old 78 RPM records will sound better and both, your records and the stylus will last longer with the appropriate stylus. You can buy the special 3 Mil stylus to play 78 RPM records from LP GUEAR. You can read the section on playing speeds of the Turntable Buying Guide to learn more about 0.7 Mil and 3 Mil styli. Here is a video with instructions on how to replace the stylus. Follow the instructions for the NP3 needle. The same instructions apply to the NP5, they just have not updated their video. The Crosley Collegiate has an auto-stop mechanism that shuts off the rotation of the platter when the tonearm gets to the end of the record. This is a nice feature, however, it shuts off too soon when playing 45 RPM records, not letting you listen the entire record. There is a small screw underneath the tonearm, inside the record player that can be adjusted to extend the playing time. Newer models do have a switch to turn off the auto stop feature. This unit does not have a tonearm lift lever which I think every turntable should have. This means you would have to manually lift the tonearm and position it at the desired spot. This player doesn’t have automatic arm return, so you would have to manually return the tonearm to its rest. 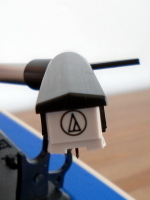 The tonearm is made of plastic and has a very rudimentary counterweight so you can adjust the tracking force. This is a feature not commonly found on low-end turntables. The recommended tracking force for the ATN3600L needle is about 3 grams. The counterweight doesn’t have a scale with numbers so you would need a gram scale in order to accurately set the tracking force. The Crosley Collegiate record player supports three rotation speeds 33 &frac13;, 45 and 78 rpm. As I said earlier, I recommend a special 3 Mil stylus for playing 78 rpm records. The platter is driven by a belt which can be easily replaced if needed. Some users have complained about the rotation speed not being accurate. There is a way to fix this, but it’s not easy. The motor, inside the unit, has two adjustment trimmers. One marked L for the 33&frac13; rpm speed and another marked H for the 45 rpm speed. You may need to use a plastic tool for this purpose to avoid grounding against the metal case of the motor. For the 78 rpm speed. 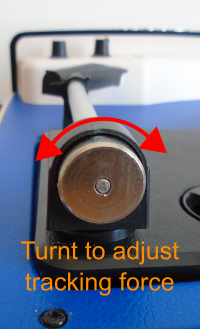 there is a separate adjustment trimmer, as you can see on the picture. 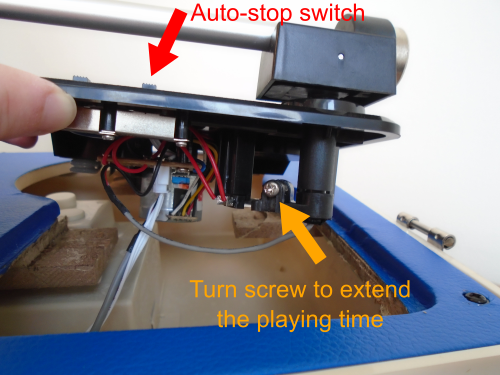 The following video shows you how to adjust the motor speed and extend the playing time. This portable record player has a 12V power supply connection. 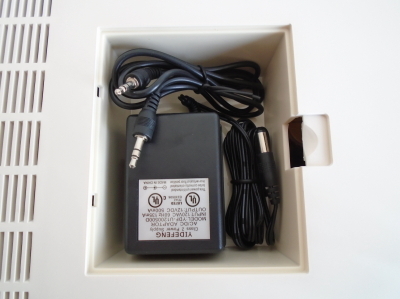 The 12V wall power adapter is included. Unfortunately, this unit does not run on batteries. 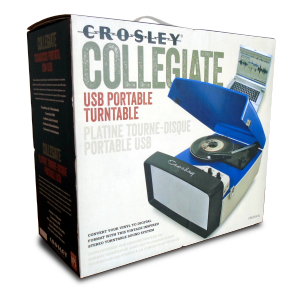 The Crosley Collegiate comes with a 45 RMP adapter. The adapter sits loose on its holder. When you close the player and take your portable player for a walk 🙂 , the adapter may jump all over, inside the cabinet. I suggest to place the 45 RPM adapter inside the storage compartment when carrying your player from one place to another. Also, the 45 RPM adapter fits very tight in the spindle, so you have to give it a nice push. This is not a problem, on the contrary, it prevents the adapter from moving during playback. 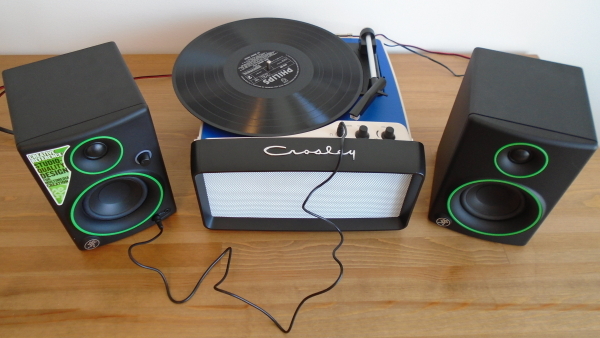 The Crosley CR6010A has 2 built-in stereo speakers and doesn’t have RCA outputs. If you need to attach external speakers, you can connect them to the headphone port using a 3.5 mm to RCA adapter cable. If your speakers have a 3.5 mm auxiliary input, you can use the cable included with the Crosley Collegiate. On the picture you can see that I connected the headphone output to the auxiliary input of my Mackie CR3 powered speakers. 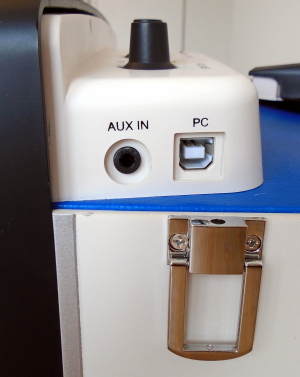 One thing that I like about this record player is the USB port. You can connect the player to your computer and convert your collection to a digital format like MP3 or you can burn a CD if you want. Note that the volume and tone controls don’t have any effect on the sound going through the USB cable. In other words, if you move the volume knob during recording, you will hear the change through the built-in speakers but the recording won’t be affected. The recording or USB volume needs to be adjusted with your recording software. I have tested the USB audio connection on several computers. On older computers (I have an Dell Inspiron 1501), the sound is “choppy”. Because of “buffer underruns” the audio stream is interrupted causing glitches, pops and other weird noises. On a new laptop with Windows 10, I got a pretty decent recording. On my Mac, the sound wasn’t choppy but it had a very noticeable electric hum. On Linux, the audio was also very choppy. I could fix it to a certain degree by adjusting the buffer size on Audacity, but I wasn’t completely satisfied. 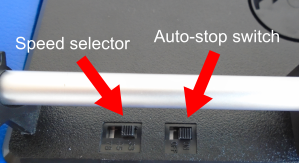 I tested the Audio-Technica ATLP60-USB with the same computers and everything went well, except that the volume on the Audio-Technica was lower. If you have a newer computer with Windows, your recordings will be OK. If you have a Mac, Linux or an older computer, you can still record your music by connecting the headphone output to your computer’s sound card. Included, there is a CD with Audacity and some user guides in PDF format. Audacity is a recording software that you can use to digitize your vinyl music. However, I don’t recommend installing Audacity from the CD as it is most likely outdated. It’s better to download the latest version from their website. Many users have reported that Audacity is difficult to use. Don’t get discouraged! If you don’t like it, you can use any recording software, it doesn’t have to be Audacity. There are other tools that you can use for digitizing your vinyl collection, here is a list of recording software that you can use. If you have a portable device like an iPod, mp3, tablet or phone, you can play your music through the Crosley Collegiate built-in speakers by connecting it to the auxiliary input. The sound quality of the Collegiate is better than most low-end portable record players. The sound of the built-in speakers is loud for a small room. I don’t recommend it for a large room or a noisy environment. The built-in speakers lack a little bit of bass but it’s not bad considering the price and size of the speakers. Plug in some headphones and you’ll be able to appreciate more detail and lower frequencies. 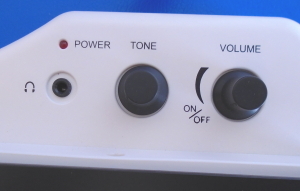 This unit has one nice feature not commonly found on portable turntables: a tone control knob. The tone control works quite well, you can really tell the difference when turning the knob. The tone control doesn’t affect the sound of the USB audio streaming as I pointed out earlier. If you want to improve the sound quality, you can always connect your player to external speakers or to an stereo system. This unit doesn’t have RCA outputs but you can attach a pair of computer speakers to the headphone jack. 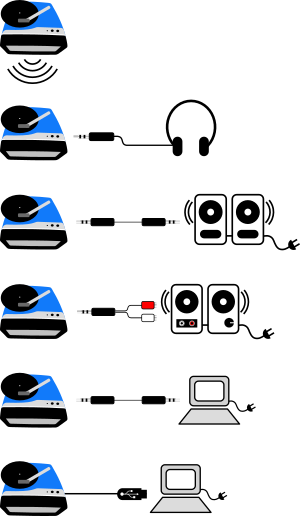 Another way to improve sound quality is to use your computer speakers by connecting the player to your computer via USB. You’ll need Audacity or another software for that purpose though. The sound coming out of the USB port has some electric hum or background noise. The background noise is louder on a Mac computer. It looks like a class room portable record player from the old days. If you like vintage looking stuff, you’ll love this product. The cabinet is completely made of plastic. It looks nice, but to me, it has a cheap feel. It’s probably because, in the old days, these type of players were made of metal and were very sturdy. But those days are gone. The lid is hold closed by metal latches on each side. The lid can easily be removed. The Crosley logo looks very nice on top of the speakers. The cabinet has rounded corners that give the product a nice look. The underside has rubber feet and a storage compartment for storing the power adapter. This turntable is very easy to operate. No assembling is required to start listening to your albums, jut plug and play. Many happy consumers agree that this model is one of the best portable record players produced by Crosley. Many owners love the nice retro look. According to many owners what sets this player apart from other low-end portable turntables is the Audio-Technica magnetic cartridge. Although the USB port is a nice feature, not many users care about it. Several users found the Audacity software difficult to use. I don’t see this as a problem because you can use your favorite recording software. Other aspects of this product that are appreciated by consumers are the ease of use, the storage compartment and the small size of the unit. I have found several negative comments regarding the durability of this product. For example, units with less than a year of use stoped working. The rotation speed slowing down after few months of use. Some people reported having returned the product due to factory defects or malfunctions. Among the most annoying issues regarding the Crosley Collegiate are: speed inconsistencies, heavy tracking force, and the auto-stop feature preventing the playback of 45 rpm records to be played all the way until the end. There is a solution for these problems that I have addressed earlier. The motor has trimmers to adjust rotation speed. This unit has a counterweight to adjust the arm weight. And on newer models the auto-stop feature can be disabled. Some users have also reported that heavy records may slow down the the motor. 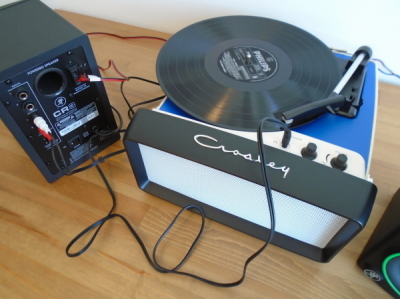 This is one of the best portable turntables made by Crosley. It’s better than many low-end portable turntables. It’s magnetic cartridge makes this product a better option than other portable record players. However, the price is high for this type of record player. If you don’t care about portability, you can get something better for the same price, you may want to consider the Audio-Technica AT-LP60 or the Sony PSLX300USB. You may also want to consider buying a refurbished vintage portable turntable from eBay or your local record store. I’m sure you can find something better for the same price. Read our Vintage Record Buying Guide for more information.